Spectra Group is an international specialist provider of secure voice, data and satellite communications systems, specifically optimized for use in remote and challenging environments, with offices in the UK and the USA. 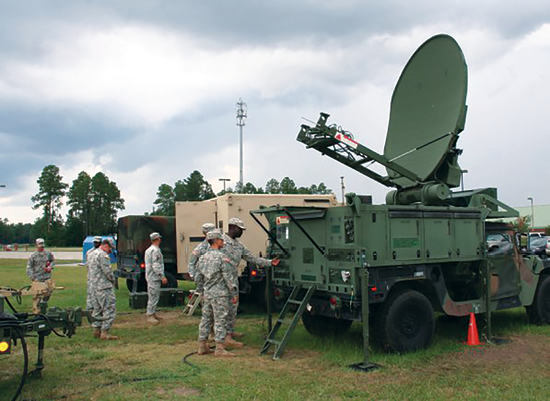 Following recent contract successes in the U.S., particularly with their battle-winning SlingShot tactical communications system, Spectra Group (U.S.) Inc. has been selected by the U.S. Department of Defense (DoD) to take part in the 2019 Army Expeditionary Warrior Experiments (AEWE 2019) at Fort Benning, Georgia. AEWE is the U.S. Army’s premier venue for small unit modernization, providing capability developers, the Science and Technology (S&T) community, and industry with a repeatable, credible, rigorous, and validated operational experiment. This event supports both concept and material development. The AEWE is an annual campaign of experimentation to place cutting edge prototype technologies into the hands of Soldiers to solve small unit tactical problems. The Maneuver Battle Lab, as part of the Army Futures Command (AFC), executes AEWE to accelerate near and midterm Army modernization and provide bottom up input to capability development, by providing early and iterative feedback on prototypes in a tactical setting. AEWE is the “first step” of a larger Army and Joint Experimentation enterprise. Being demonstrated at AEWE, Spectra’s SlingShot adds voice and data BLOS COTM (Beyond-Line-Of-Sight Communications-On The-Move) to in-service tactical VHF and UHF radios. In addition to standard voice and data C2, it can enable capabilities such as remote biometric analysis, fire mission planning, tracking and inter-agency operations. Man portable, vehicle, maritime or aviation-borne, usable on the move, delivering flexible channel leasing and with minimal increase in training-burden, SlingShot redefines tactical communication capabilities. Simon Davies, President of Spectra Group, said, this is an important and prestigious step for Spectra Group to be selected to take part in the U.S.'s AEWE 2019. The company’s SlingShot system is already in service with the world’s premier specialist forces and it has been battle-proven on multiple occasions. Davies added that AEWE will provide an excellent opportunity to showcase SlingShot’s unique, widespread, operational capability which is attracting increasing attention from the Security Force Assistance Brigades, Brigade Combat Teams, FORSCOM, and indeed USMC and NG. Everything proceeded as planned for the United Launch Alliance (ULA) Delta IV Heavy launch carrying a critical payload for the National Reconnaissance Office (NRO). off from Space Launch Complex 6 on January 19, 2019 at 11:10 a.m. PST. The launch was denoted as NROL-71 and lifted off from Space Launch Complex-6 on January 19 at 11:10 a.m. PST. This mission is in support of U.S. national defense. 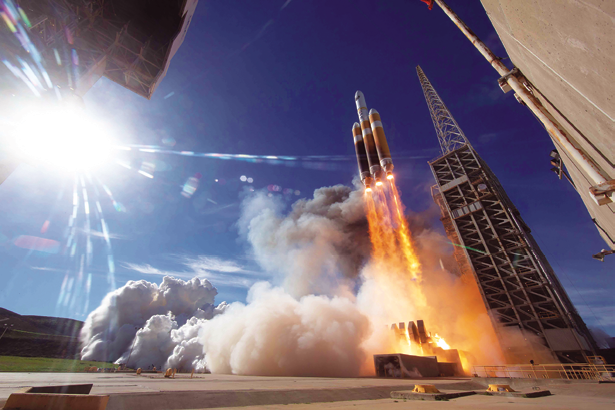 The Delta IV Heavy is the nation’s proven heavy lift launch vehicle, delivering high-priority missions for the National Reconnaissance Office, U.S. Air Force and NASA. With its advanced upper stage, the Delta IV Heavy can take more than 14,000 pounds directly to geosynchronous orbit, as well as a wide variety of complex interplanetary trajectories. The mission launched aboard a Delta IV Heavy, which was comprised of three common booster cores, each one powered by an Aerojet Rocketdyne RS-68A liquid hydrogen/liquid oxygen engine that produced a combined total of more than 2.1 million pounds of thrust. The second stage was powered by an AR RL10B-2 liquid hydrogen/liquid oxygen engine. 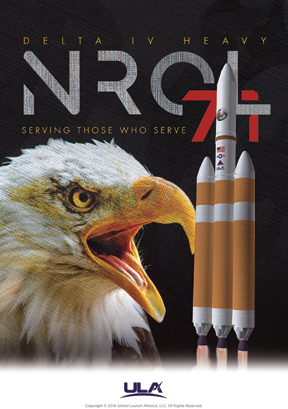 NROL-71 was ULA’s first launch in 2019 and the 132nd successful launch since the company was formed in December of 2006. 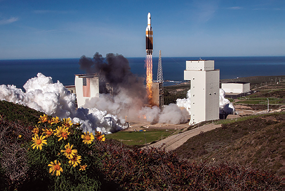 ULA’s next scheduled launch is the WGS-10 mission for the U.S. Air Force on a Delta IV rocket. The launch is scheduled for March 13, 2019, from Space Launch Complex-37 at Cape Canaveral Air Force Station, Florida. ULA has successfully delivered more than 130 satellites to orbit that provide Earth Observation (EO) capabilities, global communications, insights into the mysteries of the solar system, and support life-saving technology. The National Reconnaissance Office’s (NRO) systems are critical to National Security, U.S. policy makers and warfighters. These systems provide the foundation for global situational awareness, and address the nation’s toughest intelligence challenges. Frequently, NRO systems are the only collectors able to access critical areas of interest, and data from overhead sensors provides unique information and perspectives not available from other sources. • Assessing the impact of natural disasters, such as earthquakes, tsunamis, floods, and fires. Together with other Department of Defense (DoD) satellites, the NRO systems play a crucial role in providing global communications, precision navigation, early warning of missile launches and potential military aggression, signals intelligence, and near real-time imagery to U.S. forces to support the war on terrorism and other operations. NRO satellites also support civil customers in response to disaster relief and environmental research. NROL-71 launch photo is courtesy of ULA. Scientists created a global environment database using NRO imagery to help predict climate change, assess crop production, map habitats of endangered species, track oil spills, and study wetlands. NRO data also forms the basis for products that help depict and assess the devastation in areas affected by natural disasters. The NRO’s innovation also inspired technology in everyday life with contributions to medical imaging, global communications, high-definition television, cellular phones, the global positioning system (GPS), and much more. With its vigilance from above, the NRO gives America’s policymakers, intelligence analysts, warfighters and homeland security specialists the critical information they need to keep America safe, secure, and free. A new year and a new appointment of Senior Vice President of Government Services at RigNet — James Arden “Jamie” Barnett —who will lead the company’s efforts to build a meaningful business in the government sector by leveraging RigNet’s bundle of technology services: cyber security services, communications services, and artificial intelligence services based on real-time machine learning, and he will report directly to RigNet CEO and President, Steven Pickett. Pickett said he’s excited to have Jamie join the executive team, and they have a special role to play in this important market and Jamie is the ideal person to lead these efforts. His vast experience and leadership will spearhead the development of their government services business, enabling RigNet to provide unique solutions that will deliver more secure and effective communications in support of the nation’s critical infrastructure. Before joining RigNet, Admiral Barnett was a partner with Venable LLP, a regulatory law practice based in Washington D.C., where he chaired the telecommunications group. In 2015, he was named a Top Lawyer in Washington for Cybersecurity by Washingtonian Magazine. Prior to that, Barnett was the Senior Vice President for National Security Policy at the Potomac Institute for Policy Studies where he was responsible for the leadership in research studies and business development that focused on policy issues related to national security, cybersecurity, and homeland security. Barnett retired from the United States Navy as a Rear Adm. after serving 32 years as a surface warfare officer; his last duty assignment was Deputy Commander of the Navy Expeditionary Combat Command. Upon retiring from the Navy, Barnett was named Chief of the Federal Communications Commission’s Public Safety and Homeland Security Bureau. He was responsible for FCC activities related to public safety, cybersecurity, homeland security, and emergency management. He also led the effort to develop a nationwide, interoperable public safety broadband network for first responders: FirstNet. Envistacom has been selected by the U.S. Army Program Executive Office Command Control Communications-Tactical (PEO C3T) and has been awarded a Prototype Project Subagreement through an Other Transaction Agreement (OTA) with Consortium Management Group (CMG) on behalf of Consortium for Command, Control and Communications in Cyberspace (C5). photo by Amy Walker, PEO C3T Public Affairs. The company is to develop the upgraded Phoenix satellite system prototypes, in an effort to modernize the U.S. Army tactical satellite communications platform. 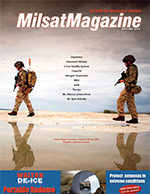 Cybersecurity threats to MILSATCOM are a relatively new phenomenon yet have quickly come to the forefront of concern for the sustainability of satellite systems due to the vulnerabilities that such threats may exploit and negatively impact. These mission-critical vulnerabilities include launch systems, communications, telemetry, tracking and command, and mission completion. 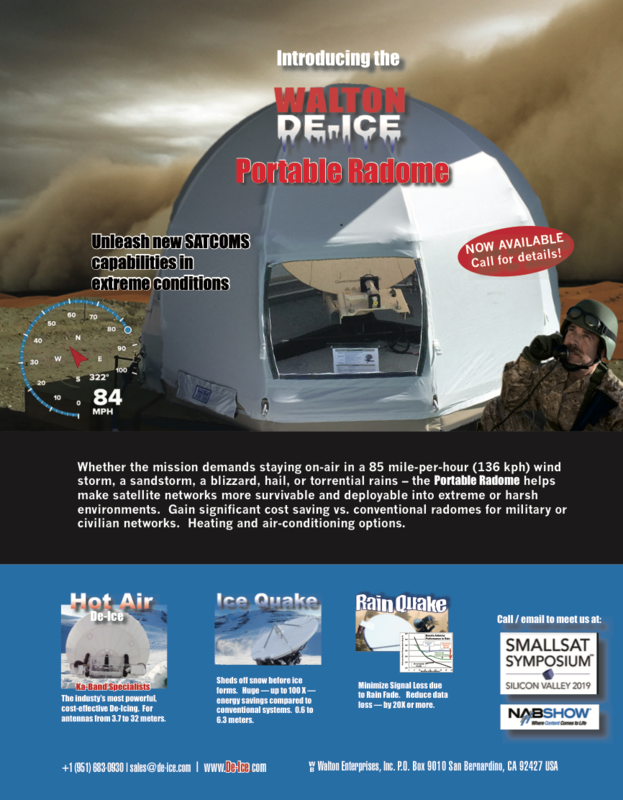 They and other aspects of satellite communications depend heavily on secure and resilient cyber capabilities for all stages of the satellite’s lifespan. Envistacom will develop system upgrades and enhancements resulting in a more agile system that is relocatable and maneuverable, reducing size, weight, and power, enabling faster deployment, greater protection from detection, and a reduced dependency on dedicated vehicle transport. Envistacom will expedite a typical five-year development cycle into just 18 months, including a rigorous testing and certification phase in close collaboration with U.S. Army Project Manager Tactical Network (PM TN) Phoenix program office. Dr. Ebonese Olfus, Vice President of Cyber Strategy and Emerging Technologies for Envistacom In support of the Phoenix program said that Envistacom’s cybersecurity team will collaborate with the company’s government sponsors and industry partners to adopt effective new concepts and apply solutions in awareness, resiliency, and threat-based defense to all Phoenix terminals.